Well, it actually began a long time ago, but at this point, I am in pure promotion mode in letting as many people know about the March 16th premiere of Guardians of Music on Detroit Public Television. I am finding myself in a unique position while in the midst of promoting my documentary as I send emails and do social media posting. Unique because I am not used to promoting a film – usually a CD, concert, or something for the Troy Chamber. At times, I find myself giggling inside when I approach people in person or dropping off a poster at a library and I say “Could you please help promote the airing of this movie I have produced”. 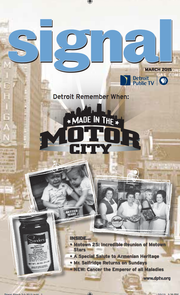 Besides my efforts in putting up posters around town, the Detroit Public Television team is busy getting ready for the March 16th date with voice overs, promo videos (like you saw above) and information in Signal magazine, Detroit Public TV’s monthly program guide. A mailing to the Detroit Armenian community will be going out in a few days and the Armenian churches have information they can share with their parishioners. The movie will be streamed live for one night only and will promote that link when its time. So — this has become a world wide premiere and can be viewed global. I can always use some additional help in spreading the word. If you are interested in sharing to your friends, please let me know. Thanks!